This plugin will let you choose which usergroups that can use the post icons. Post icons is a built-in feature in MyBB. This plugin will let you choose which groups that are able to use the post icons when posting a new thread. 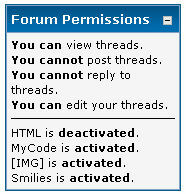 Upload the posticons_permissions.php file to /inc/plugins. After that, install it and navigate to the settings to select the groups. For support, private message me. A fully-featured plugin which creates excerpts of all posts.